Lilies are amazing; they have a wonderful scent, they are gorgeous when in bloom and they come in thousands of varieties. 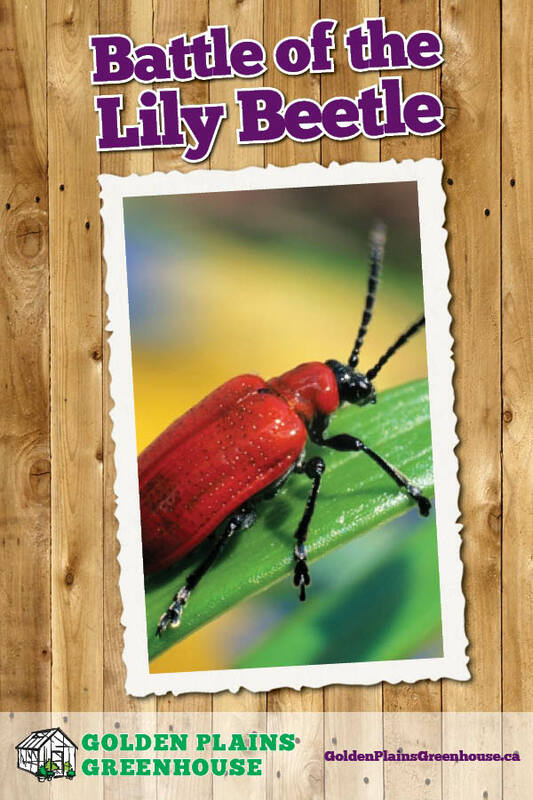 What is not amazing however, is the lily beetle. These pesky beetles devour the leaves, leaving a bared, scared stem in place of the usual sturdy stalk. There are some things you can do to keep this from happening to your lilies. The first step is to determine if you have this pest. You don't have to wait for a defoliated plant to give you an indication, you can start by checking the lilies several times a week, beginning as soon as the plants emerge from the ground. The adult beetle is about 0.5 in. long, and is red on top and black underneath. Once you spot them, it's important to remove them immediately. They are very quick and once they sense movement, they will drop to the soil and lie on their backs making it quite difficult to find them. One trick is to have a jar of soapy water at the ready, when you spot a beetle, nudge it off the leaf and into the jar. After taking care of the adults, it's time to move onto the eggs and babies. Hundreds of eggs hatch at one time and will immediately begin feeding. The larvae are yellow, brown and orange, which should make them easy to spot, however, these guys are disgusting! Their favourite defense mechanism is to cover themselves with their poop. Yes, I said poop. This makes them difficult to see. They are also harder to kill. Squishing them doesn't necessarily kill them, so it may be best to pick off the entire leaf and place that into a jar of soapy water. One precautionary measure you can take, as the adult beetles like to over-winter in the surrounding soil, in early spring, stir up the mulch or soil around your lilies and kill any emerging beetles before they have a chance to lay any eggs. There are a couple of pesticides that have shown some promise in response to the beetles. They are Neem Oil (a botanical insecticide made from the Neem Tree) and Spinosad (derived from soil-dwelling bacterium). Neem Oil is only effective in the early season and only on the young larvae. It must be applied every 5-7 days with a heavy and complete coverage. Spinosad is best used at the first sign of the beetles. Although other insecticides have shown to be effective, there is concern about how these pesticides affect the environment and beneficial, non-target insects. Pesticides containing imidacloprid, in particular, are now linked to honeybee death and colony collapse disorder. This pesticide causes the nectar and pollen of treated plants to become toxic to bees. All organic or chemical pesticides should be handled as directed by the manufacturer. There are no pesticides specifically registered for use on lily beetles in Canada.